What I CAN tell you are the films I – a slavering fanboy with lazy arthouse pretensions and a big-hearted affection for all things genre, from the crayon-dumb to the eye-rollingly over-meta – just flat-out enjoyed. Some of these films were among the best (meaning most artistically accomplished, cinematically daring or intellectually satisfying) films I saw this year. Others just plain left me with a big, dumb smile, a gut full of popcorn and an urge to jump up and punch the air (which I didn’t do because oh good god so much popcorn). Blah blah blah, etc: 2012 Movies That Made Me Really Super Happy! For American horror nuts, much of this year was a veritable cartoon desert where we, as fans, played roadrunner to a host of misguided, ineffective entries that tried to dose our psyches with earthquake pills and liberal applications of nitro, but only succeeded in rattling, immolating and pancaking themselves. Goddard's and Whedon's CABIN IN THE WOODS, though. I don’t know how much more I can say after writing a review that toddled a spider thread between fandom and sycophancy. It’s like unbeknownst to every horror film in America, every time we endured a THE DEVIL INSIDE ME or sweated out a THE APPARITION we were accruing some sort of delightful Grand Guignol Kool Aid points that we, as an unconscious collective, cashed in for the ultimate prize – an hysterical, blood-drenched deconstruction of our ambivalent relationship with both our worst fears and their lackluster cinematic proxies. Sheer joy. Additionally, Ben Wheatley's KILL LIST, a 2011 gem that only screened at the cinematheque last March, flouted a walk-the-walk ‘70s brutalism mixed with pulpy cult action. 1. LOOPER. As a huge fan of writer/director Rian Johnson’s last couple outings (BRICK and THE BROTHERS BLOOM), and two superlative directing efforts on AMC’s Breaking Bad, I had no doubt in my mind that this time travel saga, with its American future double-dip and Gordon-Levitt’s prosthetic-assisted Willis-invoking that was, for the most part, so dead-on he was practically skinwalking, would totally rip. Whether you bought into the time travel logistics or not, C’mon! Thumb all kinds of up. 2. Colin Trevorrow's SAFETY NOT GUARANTEED. I didn’t see this one on too many year-end lists, but what a gorgeous, hilarious and heart-breaking time travel movie. Aubrey Plaza shows she’s more than the sum of her deadpan sneers, and Mark Duplass is just earnest enough to skirt the bounds of relatable patheticism. The perfect gift for the romantic comedy fan in your life who’s too hip for THE TIME TRAVELER’S WIFE and possessed of too much self-respect for THE LAKE HOUSE. 3. CHRONICLE. Exhausted of the cinematic f words (“found footage”) though you may be, this low budget superhero pastiche directed by Josh Trank and written by Max Landis, son of the legendary John, leverages a mediocre plot – three teens accidentally gain psychokinetic powers - to bring deft camerawork to a staid cinematic style while paying off the characters’ super-triumphs and ultra-pains to their comic book fullest. 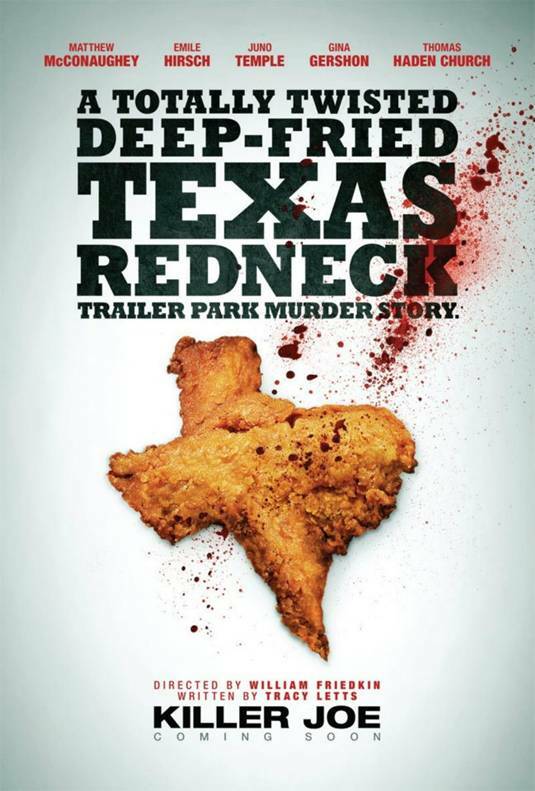 Friedkin's KILLER JOE. I loved this movie almost in spite of myself. It’s the antithesis of subtlety - so exploitative, so dark, and still so funny. More than anything else, the JOE is amazing at ramping up its darker elements – specifically brutal violence and pitch black sexual peccadilloes – from a disturbing hum to a hilarious roar to an almost baffling shattering of the sound barrier, all without sucking off its extra crispy southern noir exterior. It’d be unfair to call SEVEN PSYCHOPATHS, the second film by Irish playwright Martin McDonagh, out of control. While it’s certainly more frenzied – and a touch more reliant on the absurd – than McDonagh's IN BRUGES, it’s no less meticulously structured. While it admittedly lacks the melancholic interludes and raw emotional weight of its predecessor, it floods the void with antic bloodshed, over-the-top comic dialogue and Tom Waits pettin’ a bunny. Sam Rockwell is, as always, a highlight. Drama-wise: PTA's THE MASTER is a film that I may never love, but will find no less rewarding in the inevitable subsequent viewings I invest to discover whether love is an option; Spielberg's LINCOLN was a film I loved, but which I may never watch again. - I still haven’t seen DREDD, HOLY MOTORS or DJANGO UNCHAINED, but boy howdy am I excited about all three (also HOW TO SURVIVE A PLAGUE… but in a different way). - I still haven’t seen LIFE OF PI and man oh manwich I couldn’t care less. - Did anyone else find Julia Loktev's THE LONELIEST PLANET wicked disappointing and both its appearance on folks’ Top 10 lists and the comparisons it garnered to the work of Kelly Reichardt, like, totally unjustified? - Guy Maddin lovers: KEYHOLE! So good! - Guy Maddin haters/apathetics: Did any of you kinda dig Marc Webb's THE AMAZING SPIDER-MAN? Because I kinda dug it. - Also, as a huge Cronenberg fan who has inexplicably not seen COSMOPOLIS, let me just say: Li’l nervous here! Hope everyone had an awesome year. Fun list, Matt. 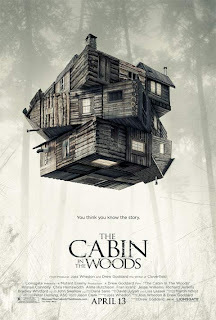 'Looper' and 'Cabin in the Woods' were both right on the edge of making my list. And 'Killer Joe' probably should have gotten a mention alongside 'The Master' and 'Beyond the Black Rainbow' as one of those movies that made an indelible impression, but which I'm still not entirely sure how I feel about. I might have put SAFETY NOT GUARANTEED on my best-of list; I like how it did better at a wish-fulfillment ending than similar blockbuster properties (RADIO FLYER, anyone?). But I guess the pic's depiction of alt-journalism as a kookie, fun occupation where you can cultivate a healthy relationship? Even more farfetched than time travel, if you ask my opinion (or Pam Zoslov's).